Becton Dickinson products are excellent from their track record (there are some cases reported of reactions in pre-filled syringes, especially from “Drug Compounding” third-party value added users of BD products). What IS problematic is the proliferation of FAKE BD syringes (yeah, do an Alibaba or Amazon search). 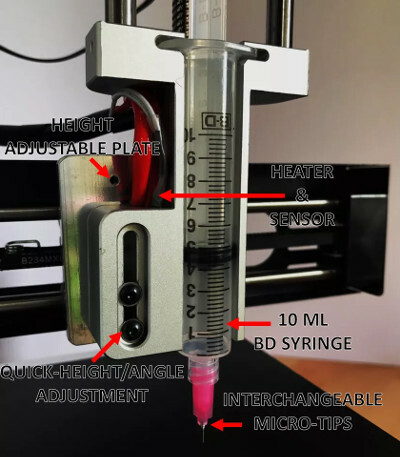 So buying a fake BF syringe when building a test 3D printer device may not matter much in the Functional development stage, but be Careful when it comes to actually testing how the device performs when actually put into in-practice. Bio-organic products MAY interact with FAKE syringe materials that do not exist in the oringal BD product. Other factors that come into play, are the mechanical properties of the plunger seal (e.g., coefficient of friction parameters) which may be different between real and fake BD syringes? But ideally, the 3D printer’s controller should measure this, and therefore become a harbinger of whether the syringe is fake or real. Post-design and into production, the take away here is supply to or strongly recommend the end-users use a syringe from a manufacturer and sales channel you trust; and BD is a good candidate IMO. One more: The usual disclaimer… I have NOTHING to do with BD. Personal anecdote – I’ve been a Type I diabetic for over 20 years now. You can guess which syringe manufacturer I use. At one point a pharmacy/insurance tried to do a generic substitute. The difference was astounding – when it comes to syringes, brand-name MATTERS. The generic brand needles weren’t sharpened properly and caused severe brusing/pain. I’ve been insisting that my doctors write “do not substitute” ever since then. You make an excellent point that I did not cover in my O.P. If you encounter poor quality syringes in terms of the needle manufacturing, I suggest you get a reasonable quality USB “Microscope” on (e.g.) ebay (not very expensive) and take pre/post-use close up pictures of the needles for comparison. Post the differences here on HaD with as much information you can obtain about the source of the different needles. This would be very interesting to see. Some pictures of the bruising you experience would go a long way too. I disagree. The next big step is to eliminate all the stepper motors and instead use little servos made from cheap DC motors and plastic encoders. Normal consumer 2d printers went that way ages ago. +1. And I want to be able to buy these too. No more lost steps once feedback is in place! Seems there may be the ability to have multi-head units that can do a range of options. That is what I have been researching and discussing to design as a project for a tool in the workshop as a CNC mill that could have more options; e.g. machine tools, CMS, printing, pipetting, dispensing more for conductive inks though could print or draw, and laser etching/burning/cutting. I forgot to add dispensing for 3D metal work also. However, I envision that to be a separate system like the 3D solar printer and the 3D UV curing polymer printers, i.e. something where the bed moves. I may be wrong though and there may be a way to integrate that is easier than I am thinking. With metals, how like with ceramics do we compensate for the amorphous nature of the product versus a controlled crystalline matrix product? The 3D organs and tissues can be on the market. I’m guessing we need more youth buying into the production more ethically and from autograph materials. i think it’s a bot. I wanted to add also there may be surplus injectors for GC’s or LC’s that could be used to dispense smaller volumes that can be cost effective. Same with maintenance trash that could be repaired for injectors that maybe need the motor or controller replaced and are pitched. I know people have been talking about this for awhile, but I personally don’t see it happening anytime soon. There just isn’t a market for 3D printers in the kind of volumes that would be required to make the R&D worth it right now. Is it possible? Sure. But why? A $200 printer is already essentially an impulse buy, and Chinese manufacturers can knock them out without having to reinvent the wheel by developing a reliable encoder-based machine. Once the open source community has some solid closed-loop printers/firmwares I’m sure somebody will clone it and put them into mass production, but I’ve seen very little development of closed-loop machines in the last few years. With the wake of 32 bits controllers there is plenty of cpu power to control 4 servos. But it still requires lot of I/O and specialized hardware. So not cheap in the end. And there is no such thing as a cheap DC brushed servo, ironless cogged servo cost a few fingers, encoder the palm and quality gears the forearm. Yeah got some faulhaber ones with hall encoder and precision gearbox, but still not really high availability/cheap in the end. “Despite the C-3PO level of disguise that 3D Cultures attempted by putting stickers over the original logo, the donor machine for the Tissue Scribe is very obviously a Monoprice Select Mini”. Do Monoprice make their own printers? The MP Select Mini is in fact a rebrand of the Malyan M200, and it’s certainly possible that 3D Cultures has gone straight to the source to get the original printers. But given the presumably low volume of their operation and the fact that they would probably want to avoid any pipeline issues involved in shipping/stocking the source machines from China, it seems more likely they are just grabbing MP Mini’s off of Amazon. I made this comment on one of the links also and want to here to clarify and add more info. When I had a chance to work in one of the Pfizer Laboratories that was basically pipetting at nanoliter levels into a 1600 microwell plates (same size as a 96 well typical microwell plate) and performing combitorial and spectroscopy activities, they wanted me to get down to 4000 wells in the same size and dispense in picoliters. This was back in 2001. I actually had taken apart a citizen dot matrix printer to make one of these 3D pipette machines in the mid 90’s. I only have the sensors from the “salvage” job ultimately. I thought pipette at the time and still do. However, I like the syringe design which is great for starters. I like the idea of temperature control taken into consideration. Now, aseptic or other environmental conditions for not only more accurate temperature control will need to be considered to maintain the various cell cultures and biochemicals. I mean some of the organs will have to be printed so they don’t collapse so other medium will have to be considered for surface tension and structural concerns. Printing a matrix is one way… printing the actual cells and ligands and other anatomical and physiological requirements requires a thorough knowledge and detail of the range of raw materials that will be required to be printing in the dispensers. Autograft, Syngraft, Allograft or Xenograft materials will also have their own tissue, cell biology, molecular biology and biochemistry issues and concerns that will have to be addressed to prevent rejection and be able to integrate. It’s been demonstrated that whole donor organs can be ‘washed’ of their cells, leaving behind the connective tissue structure. Then cells from another can be seeded into the structure and will grow to form a functional organ. IT’s onlt been done with small animal organs as yet. Where a bioprinter could drop into this is in printing the structural material from scratch, along with support material that can be dissolved. Print out a heart structure, sample some still good heart cells from a person with congestive heart failure. Culture them to increase their number then inject multiple places into the new structure. Bathe in the right sort of oxygenated nutrient solution until it’s fully colonized. The really really tricky bit would be making the structure the right way to prompt the cells to change properly for the different tissues of the arteries and veins, cardiac muscle, valves etc. Another thing to work out, growth of the new structural tissue, controlling it and stopping it for new hearts for children. Below a certain age there’s little room to cram in an oversized heart for the kid to grow up to fit. There would also be the possibility to improve on nature. The inside of a human heart isn’t all that smooth. Plenty of pockets for blood to get a bit stagnant. The chambers don’t squeeze out every last drop when they contract. Optimize the design to improve the ejection fraction and a smaller heart could do the same job as a larger one. Lungs ought to be a far easier challenge to build. They don’t have muscle, they’re basically a big sponge with a huge amount of blood vessels in close proximity to a barrier permeable to various gasses. Just the job for iterative design. Now imagine making that barrier permeable only to oxygen going into the blood, blocking out carbon monoxide, carbon dioxide, nitrogen and other gasses while still allowing CO2 and others to leave the blood. Huh, I think you are definitely thinking correctly with a few items to consider. First off, if the biochemistry of the donor is not corrupted somehow and is functioning or can be controlled as can optimally for their moment in lifecycle, then the growth rates will be modulated/moderated by the physiology/biochemistry of the patient/recipient. Also, think in regards to cells that are different like different colors in an multi-color printer cartridge or like Melvin Calvin’s peptide and protein manufacturing devices where you have to have a bunch of colors/bottles of amino acids basically which would be the different cell structure types instead for the tissues required to be able to print those different tissues at the same time. We have to print all the cells that make up the tissues in the organ period. I don’t see some work around being feasible after a certain age. The cells will be very specific in their differentiation after a certain age. The environment would be the whole range of what is required for the living tissues; that would be cells and biochemistry basically. Nutrients for sure, though don’t forget the other range of macro-molecules and microbiological’s in between. Those later range can be printed at the same time though may need to have consideration for where fluids are to be filled with something that can be dissolved out so not to collapse if the tissue is not rigid enough to support itself and won’t print unless there is a complex algorithm to model the inflation/intubation later to get back to the dynamic living structure form volume. Then the organ will have to (and really can be already) equilibriate and change control to avoid shock in a bio-equivalent living system incubator or carrier device (environment, boundaries and internal system critically designed) to survive and even have a period of anabolic growth to fill in the gaps and even could be shrunken potentially even to do performance verification though that may take more time than most will want. The sizing factors would be hormonal and can be obvious to me. Neurotransmitters and other factors would also effect the operations regarding size. Balance of blood cells, cytochines and other biochemistry noted in a physiology book would be regulated by cells though those not found in the grown cell will need to be input into the internal system since they are not in that system (note: critically controlled at the boundary so not to shock the internal organ system). When you think from a nutrient perspective… you have to think about filling in the blanks between nutrients and organ structure in the healthy living system. What do all those nutrient form in the body in between and how you control all those environmental conditions, like standard temperature and pressure (STP). So, temperature, pressures, pH, moisture content or really hydration level, concentrations of those mixtures (isotonic/hypertonic/hypotonic), etc. Lot’s of variables to consider… though once all the biochemical pathways are mapped out… the design requirements for the user product will be identified, qualified and quantified. Then a system to meet the specifications will need to be designed per specifications. Again, most are gross frauds and cheats that compound their continuing criminal enterprise of pan troglodyte at least where I come from. If they can’t poison you, they use radiation treatment centers devices or other dangerous compounds that forensics doesn’t seem to care about testing for. So, nothing ever advances other than into the ground or what can be stolen from the few who survive long enough to make improvements. Great article by the way. We need more of this going on ethically. Transplants from donors can not be required ultimately. We can require autograph reproductions that are bio-equivalent and better than by meeting and exceeding specification. The technology is cool and rather impressive with what can be achieved but then we talk about ethics in healthcare. Where’s the ethics when it comes to our planet been overpopulated and people end up starving to death or suffering from malnutrition because we kept so many “faulty” people alive. The pain of loosing a loved one to a disease or failure of an organ is a traumatic event but the effects of overpopulation are a much more sinister failing of our society. Most are to lazy to “actually” perform a MASS and ENERGY balance of what is required for survival in regards to raw material resources, intermediates and finished products/goods. They think and like bad’s I guess.. Most go by hearsay and make delusions that they repeat that the last malicious intent operator or disinformation agent led on to compound and conceal their continuing criminal enterprise. How is the planet overpopulated? Where is the real data? Yes, there is an issue with the death sentence not be enforced and homicidal maniacs that are forensically clean mass murdering those that are advanced, domesticated and more complex than the layman pan troglodyte trying to act human and is fact more of a subhuman malicious in act that does activities that are not required for survival and only victimize others. That is all. Please elaborate if I missed something. Again, psychological issues are one thing. How is population such an issues? Heat is the only issue we need to deal with that can get out of control. I suppose losing water to space is an issue as well as gases like Oxygen. What else is the issue that is so bad regarding overpopulation? I’ve only heard neuters or deviants speak of such things? Excuse me, I can say mentally ill and criminals speak of such “over population” theories. Most that speak such nonsense seem primate more than human being advanced, domesticated and complex considerate of helping other living systems survive. Why aren’t there sky scrapers of natural resources or farms? Why do you think such delusional thoughts like that? Those thoughts are really scary to me. Quaint, humble, quiet, or some other rhetoric lifestyle of the existentialist or naturalist stuck with high population density cities or criminals that do not follow standards to avoid arguments and combat ill health, danger and lack of valid governance? Can’t have that way so there are no considerations for others range of development or disability due to their environments “opinions” range of rhetorical “theories” for the time and resource cycle they stole or leach from?